(Also, all parts may not be original to each Stomper. He may replace gears if they're broken, rims if they're cracked, tires that are rotted, and lights that are broken. Minor wear. The motor runs great. ). 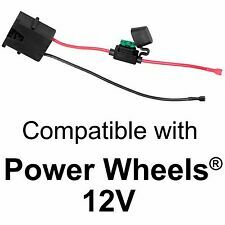 The connector is 100% compatible with all Power Wheels® 12-Volt ride-on toys from Fisher-Price®. 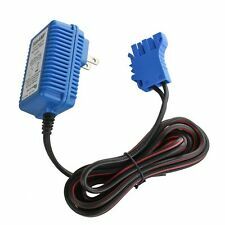 Use it to connect a standard 12-Volt SLA battery to your Power Wheels® vehicle. 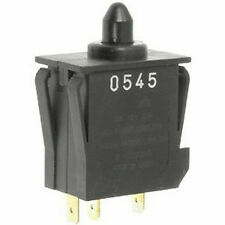 A 40-AMP fuse is installed on the harness and it is replaceable. THE ITEM IS LIKE NEW.THE BOX IS GOOD SHAPE. NOTE: Batteries NOT included in sale ! MONSTER TRUCK. LIGHTS AND TRUCK RUNS. Looks to be used. 3-3/4” X 2-1/2”. Vintage Tiger Boom Box Hitclips Player With Britney Spears "Stronger" Free Ship. Condition is Used. LARGE LOT OF 10 VINTAGE 80s ELECTRONIC HANDHELD GAMES! !, INCLUDES SOME RARE TITLES! !, TIGER ELECTRONICS BRANDS, COPYRIGHTS 1987/1988, LCD DISPLAY SCREENS W/ SOUND EFFECTS, INCLUDES GAME UNITS AS PICTURED ONLY, TITLES INCLUDE MEGA MAN 3, KINGS OF THE BEACH, X-MEN, FOOTBALL, GAUNTLET, DOUBLE DRAGON 3, JORDAN VS BIRD, STREET FIGHTER II, PIT TIGHTER, AND KARATE KING, GOOD CONDITION LOT OVERALL W/ GENERAL SIGNS OF WEAR FROM AGE, PREVIOUS PLAY/USE, AND STORAGE, ONE OF THE GAMES ISN'T WORKING PROPERLY, LIMITED TESTING HAS BEEN COMPLETED FOR ALL UNITS AND MOST ARE IN GREAT WORKING ORDER W/ SOUNDS AND LCD DISPLAY SCREENS WORKING GREAT, SOME HAVE HEAVIER SIGNS OF WEAR AND/OR DEFECTS/FLAWS PRESENT THAN OTHERS, PLEASE SEE LISTING DESCRIPTION FOR ALL PICTURES AND DETAILS!!. Made by New Bright Hong Kong, this is a 1978 Dodge Monaco 440 with a City of Milwaukee police sticker on the hood. Car moves, lights flash, siren blares. Expect light general wear from use and storage, but nothing major. Has part of cloth pants unraveling wear and tear from light play works great. 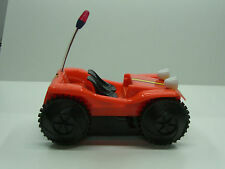 This is a 1950s 1960s tin battery-operated toy. Police car. Made by Line Mar. Here is a toy that looks to never have been used from the 1950's. When new, bubble solution was added to the small bowl on the stand, the musician would drop his horn into the solution bring it up to his mouth and blow bubbles then start all over again. IT'S A VERY HARD TOY TO FIND IN THIS CONDITION! NEAT TOY THE CLOWN WALKS, SMOKES HIS PIPE (pipe lights up), TAKES HIS HAT OFF THEN PUTS IT BACK ON & SMOKES (when his hat is off he smokes from the top of his head - see last picture). This old toy is in good, used condition. The colors are still vibrant. There are a few scuff marks. The gears are all intact. Good Condition. Playskool Hasbro• Monty the T-Rex DInosaur• Kota & Pals• Interactive Walks/Roars. Condition is Used. Shipped with USPS Priority Mail. 1999 Original BUMBLE BALL Toy 5" Tested & Working- Free Shipping. Condition is Used. Shipped with USPS Priority Mail. Played with condition and is missing the light on top. 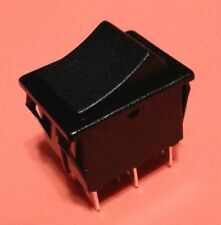 May be good for parts or for display. Power Wheels Disney Minnie Mouse Happy Helpers Jeep Wrangler. Bright Disney Minnie Mouse graphics & Jeep styling. Pretend radio with character phrases & Jeep sound effects. We only process orders that are paid in full. Tested working. Lights, winch and both forward and reverse (hi-low) gears work. It doesn’t run like it’s new. One wheel has a little wobble and the gear train is a little noisy. Winch string/hook is missing. But this is a super cool toy! Very rare. Very fun. And very hard to find working. See pics for all details. BATTERY OPERATED SMOKING GRANDPA W/ ORIGINAL BOX, 1950'S JAPAN, WORKS GREAT! THIS IS A BATTERY OPERATED SMOKING GRANDPA W/ ORIGINAL BOX, MADE IN JAPAN DURING THE 1950'S. THE TOY REQUIRES TWO "D" SIZE BATTERIES AND IS FULLY FUNCTIONAL! GRANDPA ROCKS BACK AND FORTH IN HIS CHAIR, LIFTS THE PIPE AS IT LIGHTS UP, EXHALES SMOKE FROM HIS MOUTH, LOWERS HIS ARM AND THE ACTIONS REPEAT. 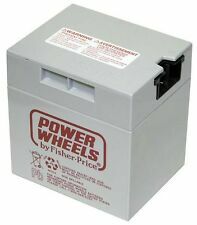 Fisher Price / Power Wheels Battery. 12 Volt Sealed Lead Acid Battery. Factory Fresh Battery with Current Date Codes. The battery will arrive in great condition. NEW Little Live Pets- Cuddles My Dream Kitten. Condition is New. Shipped with USPS Priority Mail. Wing Mirrors. Motor type - Twin 12V motors. MP3 player socket and lead so that you can play your favourite tunes. Seat belt - The car has a seat belt fitted, to keep your child safe if using the parental remote option. Vintage Rosko Battery Operated Bartender Tin Toy W Box Works 11"
Just press her hand to change modes and squeeze her belly to hear her heartfelt sounds. Vintage Sammy Skates 1985 Musical Roller Skating Teddy Bear w/yellow suit. Condition is Used. Shipped with USPS Priority Mail. DECOY ROY Gemmy Animated Singing/Talking Duck Mallard Duck Hunters Man Cave RARE. Condition is Used. Shipped with USPS Priority Mail. LJN 255 computer command corvette, taken apart and repaired. I took the car apart. I got the steering control motor unseized, which can happen when it sits unused for a long time. I replaced the steering motor gear with a new gear and a few drops of super glue. The plastic gear over time contracts and cracks which is why 99% of theses ljn cars fail. I lubed the steering gears. I also replaced the wheel drive gear I replaced a missing tire and some damaged decals. This is the 17th 255 car I have gotten working again. It does all its commands and runs great. See photos for car condition. This toy has been tested with batteries and it is NOT WORKING. The box is in worn condition, and has been repaired with clear tape on the inside of the box. It has been tested and does work. There is a wheel missing. No Exceptions! Local Pickup. Rare LJN Camo Jeep smart car. It does work with a 9 volt battery. It doesn’t seem to always do the commands I put in but I may just be not doing it right. Power Wheels Hood Latch (Set of 2). 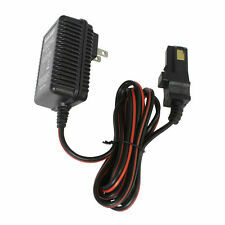 12 Volt Wall Charger AC Adapter For Kid Trax Avigo Mini Cooper - PLEASE READ!! Avigo 12V Mini Cooper. It will not work for model later that 2015. will work. See the second and third picture to compare to what you have.